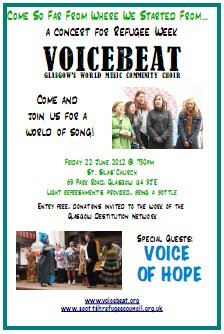 Concert for Scottish Refugee Week. Free entry, contributions requested to the Glasgow Destitution Network. Special guests: the Voice of Hope choir from the African Health Project of Waverley Care, led by Frances Hume (right).